Blog Quick Quotes: Father's Day Card Inspiration with Connie! Father's Day Card Inspiration with Connie! 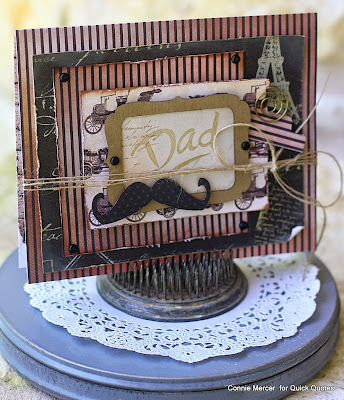 Hi, Connie here with a Father's Day card using some of the Gypsy Road papers by Quick Quotes and the fabulous, PowderPuff Chalk Inks. The papers are very manly and look great layered. * Layer papers from the Gypsy Road set. All different sizes, so each paper is showing. * Use a paper distress tool and go around the edges of the papers. * Ink the edges with Quick Quotes PowderPuff Inks. * Staple the papers together in the center. * Attach black brads to four corners of one of the layered papers. * Stamp "Dad" on a small coordinating paper (Joy Ride). * Ink up the chipboard frame (Bag of Chips). * Adhere with brads at each end. * Adhere all layers and frame to front of card. * Add mustache (die cut) and twine.